Extension Description: Caramel creates a virtual cash system on your board. Users can earn points from actions that you configure. ACP-configurable cash system that allows users to earn and exchange points. 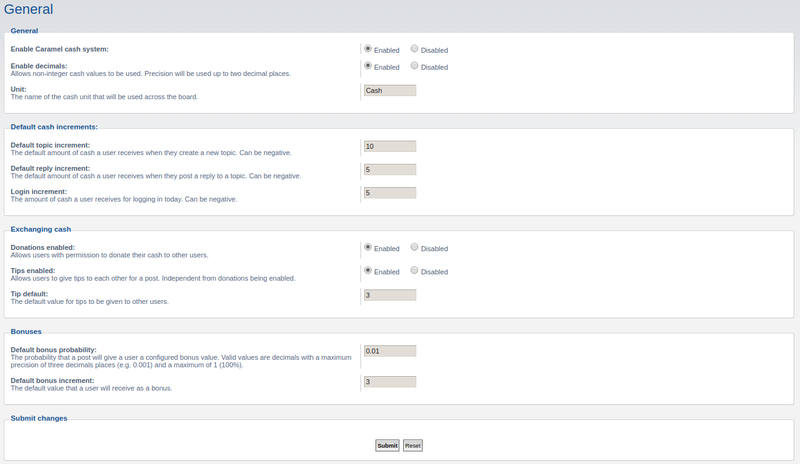 Increments configurable for new topics and posts. Allows configuration of cash increments for individual forums. Allows users to donate cash to other users. MCP module for Managing User Cash. Configurable random bonus increments, with notifications. Tip button on posts, allowing users to quickly donate to one another. To install, first drop contents to /ext/carsonk/caramel. The file ext.php should reside at that path. You then should be able to enable the extension under the Customize tab in the ACP. Please let me know how you intend to use Caramel in your community, either in this thread or over PM. It helps me to know what to focus new feature development on. Last edited by Innavigable on Sat Feb 03, 2018 3:29 pm, edited 4 times in total. Is it possible for one group to earn more points than the others? Like a VIP group? do you intend to make a shop to buy some things with the points, such as name change, access to some forum, entry in some forum etc? option to donate only with two conditions, if the user has fewer points than x or more points than x, is it possible? 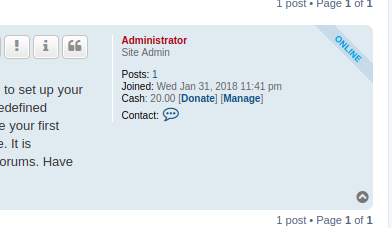 Do you have the option to pay to post in a forum? tl;dr: If enough people have a desire for any specific feature addition, I'm fine with taking the time to add it. Currently, no. It seems like a good idea. If enough people have this use case, it wouldn't take too long to add. Probably not for the name change. Previously when Caramel was around administrators would deduct the cash and then perform the name change. Automating this process is probably not worth the development time. Paying for access to a group would be cool. Currently, no, but that's an interesting idea. Again, if this fit within enough people's use case I would be down with that. Not yet, but this would be neat. Do you have the idea to leave this ext compatible with others ?? When I built this extension a while ago, I had built a lottery extension that goes with this which I'll probably revisit at some point. In the case of integration with extensions that aren't mine, I think it would be on those particular extension authors to add Caramel support. They would just have to get an instance of caramel_manager and call the cash management functions. Last edited by Innavigable on Fri Feb 02, 2018 11:15 pm, edited 1 time in total. I wanted to install your Ext but I can not activate it must I create a new folder or rename the ext? Sorry, yes, the contents must be dropped to /ext/carsonk/caramel. I'll make a note of that in the initial post. I have tested your ext now. That's very good at first sight. I would still wish that there are more points for other areas. for example Points for registration, friend requests. There are still settings for notifications when you get points. How would you like points for friend requests to work? I'm currently working on prices for posting topics or replies in specified forums. I'm also interested on functionality of this ext. Trying to Delete data but..
How can I delete the ext & it's data ? I have this fixed on another branch. I'll get in merged in so you can update and do the deletion. Great plugin you have going here. I was wondering if the calculation includes all characters in a post? It would be great to disallow bbcodes to stop abuse. So that if someone made a rainbow text for a word, the bbcodes would inflate the earnings per post.